Fortunately I was reminded today of The Can’s rather inaccessible location, as I have been meaning to relocate it for a while now. I have now moved it to a place where I not only instantly know where it is, but can easily grab and rescue it from fire, flooding, storms, earthquakes or any other natural disaster. The Can definitely falls into the category of those material possessions one hopes to rescue first in such an event. 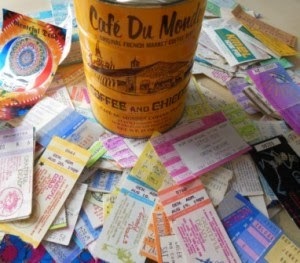 This seemingly innocuous object, an old Café du Monde can from my years in California, holds an invaluable treasure trove, items of inestimable monetary value (in spite of the face value printed on them, ridiculous by current standards given the over-inflated prices of concerts these days): the ticket stubs from many (yet far from all) of the concerts I went to when I lived in California in the late 80s and early 90s, before uprooting myself (and The Can of course) to move to the Netherlands in 1992. A well-travelled can it is, having made its first move, albeit humble, from Monterey to San Francisco after I graduated from business school and went to seek my fortune (but mostly just a job, any ole job would do) in The City. Later, its travels would include a 7 (or was it 8? )-day cross-continental journey from San Francisco to Miami in a box, kept company by hundreds of bootleg tapes with recordings of concerts I had been to and others I wish I had attended, in the back of a U-Haul hitched to my car, crossing the Southwest, assorted deserts, sweating for two full days traversing Texas and then over through Bayou Country (with a quick stop in New Orleans, where alas, we were a day late and jello shot too short for Mardi Gras) before finally entering the Panhandle of Florida, continuing its journey all the way down to Miami. From there, it would be shipped in that same box in a sea container, along with my car and nine other bulging boxes containing other absolute necessities, to finally be unloaded at my new home in Rotterdam. Subsequently suffering through three other moves to its current home in the southernmost province of the Netherlands, today I decided I needed to take that trip down Fuzzy Memory Lane again, having been reminded of The Can’s existence, initially prompted by a documentary on Quadrophenia I stumbled upon zapping channels late yesterday evening. I carefully and slowly sliced through the tape I had used to seal the box for the last move 12 years ago (having snuck a peak in the box, mostly to ascertain The Can was still there before entrusting it to the movers), holding my breath, though I knew it still had to be there. And it was. After all those years, all those moves, the metal is showing only the tiniest signs of rust, and the old-school, dot-matrix printer ink is even still fairly legible on most of the ticket stubs. Others are surprisingly pristine, with dates ranging from 1986 to 1991. I removed the stubs slowly, carefully, not sure which ones to look at first, wondering whether to count them, estimating their number to be over 150. These precious jewels, tickets to the past, keys that had the power to unlock doors to amazing memories. Concerts I had forgotten about, others that were indelibly imprinted on my memory, still, after all these years. Flashes of images like still photographs coming back to me, who I was with, where we went before, and after, even memories of me changing from my work attire into my concert togs in the bathroom of the office I worked at, waiting until everyone had left so that no one would see me emerge in my tie-dyed T-shirt (back then, I might have still cared about stuff like that), tiny silver skulls dangling from my ears, brightly-colored woven bracelets around my wrists. I worked about 20 minutes from a few of the more popular concert venues, so it was easier to meet friends there straight from work than to go all the way back to The City and go from there. Memories of sitting in circles on hot concrete, in parking lots outside of stadiums, with friends, waiting for the gates to open (stadium seating! ), not so we could get the best seats in the house, but what we considered to be the best seats, and more importantly, enough of them so we could all sit together. Watching the pre-concert scene unfold, both outside of the venue, and once inside it, as the seats filled up, people milled around on the floor, and the soundboard guys did their thing, the recorded music slowly swelling, the sound getting tweaked and balanced, so by the time the band got on stage, it would be nothing less than perfect. Lights being tested, on and off, stage hands testing instruments, moving them and monitors to just the right spot. ‘Testing, testing, 1-2-3’ could be faintly heard weaving in and out through the recorded music coming from the speakers as they tested the microphones. I remember that excitement so clearly, and the familiar comfort and ease of being with those friends, our inside jokes, our trusted patterns and habits with one another, our history together, the mere looks that would be enough (since words weren’t necessary) like it was, well, the day before yesterday. I can hardly believe it was 25 years ago. I look back on that time with such pleasure, a huge smile slowly creeping onto my face - how lucky I was to have been able to experience that, and have a group of friends like those - most of whom are still good, close friends, no matter how far we may live from one another, and no matter how infrequently we may see one another. Sifting through the stubs I can pull one out at random, read it and be transported back. Like a free ticket for a ride on a time machine. Sure, those days are gone, and I know I can’t go back, but these tickets, The Can that keeps them safe, protected from the elements and intact for as long as possible, sure are a wonderful way for me to visit every now and then.